Do you ever wonder about some of the words in the Bible? Words that are supposed to be good, but which sure don’t sound good to you? “Longsuffering” is one of those words for me. God says that “longsuffering” is a fruit of the Holy Spirit, so it must be a good thing. But if it’s such a good thing, how come it doesn’t sound so good to me? I really don’t want to suffer longer, thank you very much! 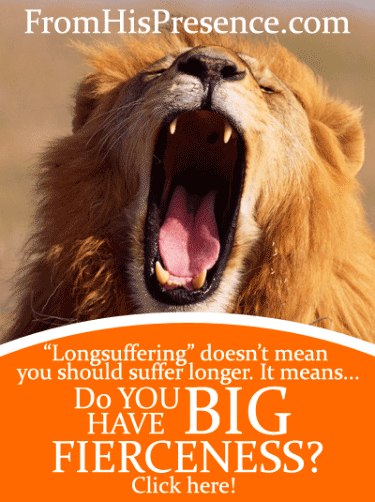 “Longsuffering” doesn’t mean “suffering longer” at all. We don’t get a badge just for going through more hell in life. Think about the concept of big fierceness for a minute, and it will start to make sense to you. To get through hard times with a good attitude, you need to have BIG FIERCENESS. To keep going when you feel like quitting, you need to have BIG FIERCENESS. To not give up on a person you feel like giving up on, you need to have BIG FIERCENESS. To go after the dream God has placed in your heart, you need to attack life on purpose with BIG FIERCENESS. Related: Your Dream Will Test You and Longing For More In Life? Put Your Toes In! This list could go on and on. Big fierceness means we attack life on purpose. We will stand when standing seems impossible. We will advance when the world sees only retreat. We will walk in power whether anyone else believes in us or not. Big fierceness. Are you ready to get this big fierceness? Big fierceness is simple to get. It’s a fruit of the Holy Spirit. That means HE is the One that gives big fierceness to you. It comes from Him and flows through you if you will let it. If you know Jesus Christ as your personal Savior, the Lord God of hosts lives inside of you and is ready to roar at the world through you with BIG FIERCENESS. After you get His fierceness, you will never be the same. Life will no longer happen to you. You will happen to it. Won’t you take a moment now and ask the Lord to give you His big fierceness? Also, if you would like prayer for this fruit of the Spirit, you are welcome to post a comment or message me, and it would be my honor to ask the Lord to manifest His big fierceness in your life. Jamie, Gracias!! Necesito de parte del Señor una gran ferocidad en mis oraciones para lo que Él nos ha llamado a emprender.. DIos te bendiga! Jamie, I need to say this to you! I can’t keep it in any longer!! 🙂 Every time I see your beautiful smiling face, I see passion, I see fire, I see love, I see a joy unspeakable, I see fierceness, I see boldness, I see fearlessness, I see peace, the peace that surpasses all human understanding. I see “I am ready to tackle anything that comes my way!” I see a mighty princess warrior of the Almighty King, our Lord Jesus Christ. I see you dressed in your full armour. I see you wielding that sword of yours with determination. And let me tell you this : The devil is petrified of you!!! Halleluuuujah Lord Jesus!!!! Amen Lord. Thank you for blessing us with a mighty warrior to encourage us Lord! Dear sister I am in a season of standing and I do need “big fierceness” please pray with me as I petition or Father to release this fruit of the spirit within me. Jamie, thank you! Iwould love a prayer for big fierceness. Jamie, thank you! I would love a prayer for big fierceness. I need big fierceness as I face the physical pain I am in right now and the financial issues we are presently facing. I am continually seeking His presence and petitioning the Father to grant me the strength to stand as I go through this time. Please pray that the Lord will manifest this fruit of the spirit in my life. Thank you and God bless! I need BIG FIERCENESS right now as I face a giant! But I know my God moves mountains and makes giants fall??? ?I’m grateful for you Jamie and what the Lord is doing through you????❤️?? 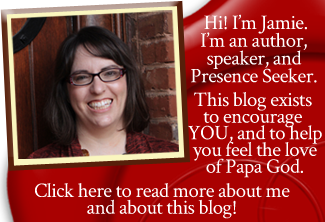 Hi Jamie, I definitely need prayer for big fierceness in every area of my life! Thank you in advance! Your ministry is great! Blessings to you!